One thousand. Two weeks ago, this column and many more around the country led with that number. Duke head coach Mike Krzyzewski had just become the first men’s college basketball coach to reach the 1,000-win plateau on an historic Sunday at Madison Square Garden, and in the aftermath, Coach K and that number were the talk of the sports world. Today we celebrate another ACC legend. But we do so for a different reason, and in a different tenor. We’ll get to the basketball soon enough, but as you’ve probably heard by now, legendary North Carolina coach Dean Smith — a former rival of Krzyzewski’s — passed away on Saturday. He was 83. Since the news broke Sunday morning, messages extolling Smith’s many virtues have come from far and wide. They’ve come from former players and adversaries, columnists and commentators, even from the President of the United States. Many of us have mourned college basketball’s loss, but even more have celebrated a life that so special to so many people. And that’s what this should be: a celebration. Like Krzyzewski, Smith was obviously an outstanding basketball coach. He was innovative, sharp and bold — and, without question, driven by his competitiveness. He too set a number of records while at the helm in Chapel Hill, but those accomplishments are only the subtext to the discussion. That’s because Smith wasn’t defined by his numbers, as good as they were. 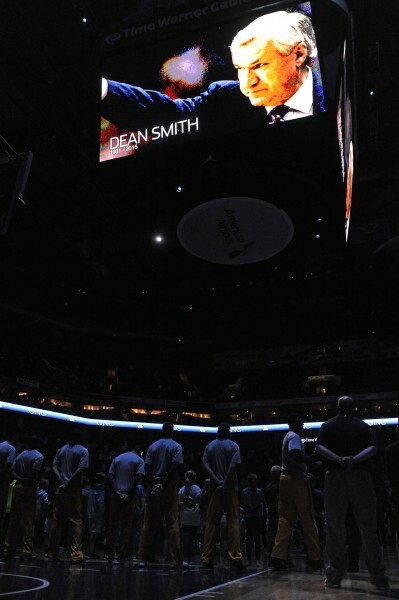 Ask anybody who knew the man, and they’ll tell you the same thing: Dean Smith was defined by the way in which he impacted the lives of others. He was defined by stories of grace, loyalty and sincerity. Smith coached before my time. But it’s through those stories that I have gotten to know him, and it is those stories that allow everybody — well beyond the entire college hoops community — to recognize how truly wonderful a man he was. I can’t relate those anecdotes myself, but others — like ESPN‘s Dana O’Neil and The Washington Post‘s John Feinstein — have. And they’re beautiful.